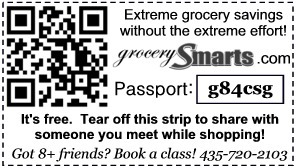 Like us on Facebook This list is made by Aimee from Grocerysmarts.com. Feel free to contact us if you have questions about this list. *** ATTENTION - You now need a Walgreens Balance Rewards Card to receive advertised prices and earn points to earn you rewards! Rewards are given starting at 1,000 points and are tracked on your Balance Rewards Card. If you use your rewards on the lowest accumulation (which is 1,000 points = $1.00 reward) this is equal to $1.00 reward for each 1,000 points. Please see THIS LINK for more program details. *** See the Walgreens Coupon Policy on their website at This Link Please note - the number of manufacturer coupons, including Register Rewards/Savings Rewards manufacturer coupons, shall not exceed the number of items in the transaction. This means you MUST have at least the same amount of total items as you have coupons. *** The following group of items must be purchased in groups of 2 to receive discount. The following items will earn you points towards a discount good on your next shopping purchase. Rewards are given starting at 1,000 points and are tracked on your Balance Rewards Card. Each 1,000 points is essentially a $1.00 savings. Please see THIS LINK for more program details. Sale price indicated is BEFORE/AFTER reward is calculated. *** Buy 4 of the following products and receive 5,000 points (essentially a $1.25 reward). Please see THIS LINK for more program details. Sale is essentially a $1.25 off discount on each item. Sale price indicated is BEFORE/AFTER reward is calculated. ***** Spend $20.00 on the following products and receive 5,000 points (essentially a $5.00 reward). Please see THIS LINK for more program details. Sale is essentially a 25% off discount on each item. Sale price indicated is BEFORE/AFTER points are calculated. Use the 'Before' price to reach $20.00. The following items will earn you a voucher good on your next shopping purchase. ***** Buy 2 of the following products and receive a $5.00 voucher good on your next shopping purchase. Limit 1 voucher. Sale is essentially a $2.50 off discount on each item. Sale price indicated is BEFORE/AFTER voucher is calculated. ***** Buy 3 of the following products and receive a $6.00 voucher good on your next shopping purchase. Limit 1 voucher. Sale is essentially a $2.00 off discount on each item. Sale price indicated is BEFORE/AFTER voucher is calculated.